This production opened on December 6, 2013 and closed on December 15, 2013. 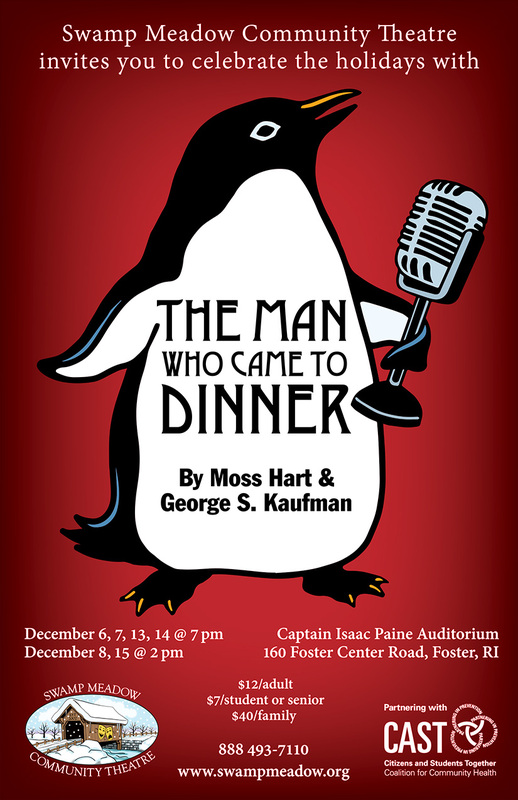 Cassandra duCharme directed this amusing production for SMCT in the winter of 2013. Radio and public speaking celebrity, Sheridan Whiteside, having dined at the home of the Stanley’s, slips on their doorstep, breaking his hip. A tumultuous six weeks of confinement follow. The Stanley living room is monopolized by the irascible invalid; ex-convicts are invited to meals; and transatlantic calls bring a $784 phone bill. The arrival of strange gifts from his friends further destroys domestic tranquility. It would take a stoical housewife to harbor penguins in her library, an octopus in her cellar, and 10,000 cockroaches in her kitchen. When Maggie, his secretary, falls in love with the reporter, Bert Jefferson, Whiteside summons a glamorous actress, Lorraine, to win the affections of the young man. Performances were held on December 6, 7, 13, 14 2013 at 7:00pm and December 8, 15 2013 at 2:00pm.